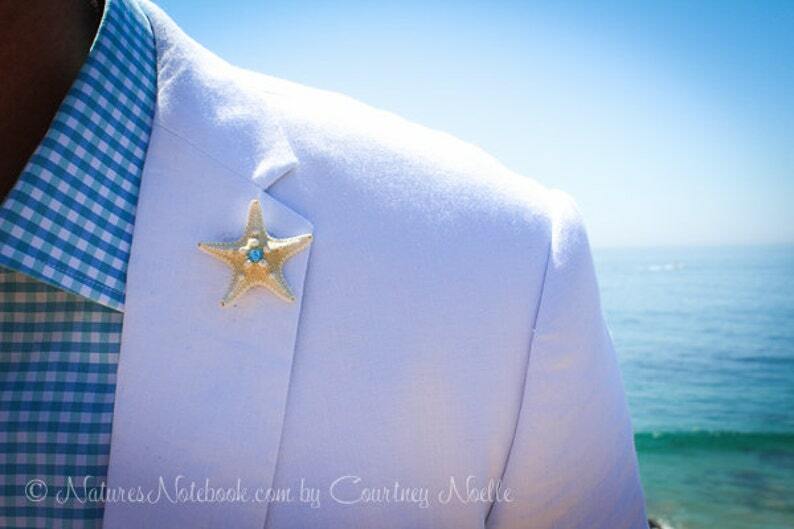 Starfish boutonniere makes the perfect accessory and accent for a destination or beach themed wedding. Starfish will be embellished with a Swarovski crystal color of your choice.This is a dainty knobby starfish, so is just the modest accent for your groomsman. Best of all, this will be a treasured keepsake from your wedding that will be treasured always. Starfish size - 1-3 "
These starfish boutonnieres measure about 1-3 inches long and come with a silver two-piece fastener securely attached for fixing to your jacket. If you would prefer a clip, just let me know in the comments section at checkout. If you choose a clip note that this can be worn as a hair accessory as well.